These smoked mussels are a great combination with salads or as an appetiser on crackers. Imported NZ Mussels, vegetable oils, salt, natural woodsmoke. Keep refrigerated at 4°C. May be frozen. When opened use within 3 days. May contain bone. Allergen: fish. Mussels may contain shell or traces of crustacea (crab). Allergen: crustacea (crab). 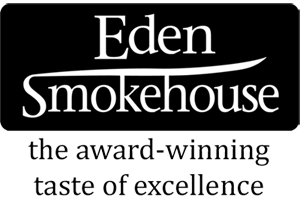 Copyright © 2019 Eden Smokehouse. All rights reserved.